I feel so lucky to be living in a time where everywhere I turn there are women living their lives and doing things that bring me joy and inspire me. These women are mentors and friends. They are women in the media, writers, women in business and women next door. Some of them are what I would call Wild Women, women living their authentic selves. Brene Brown for her courage, leadership and being authentic. I wrote about Brene in this post. Tara Mohr (Playing Big) for daring me to step into my power. I read Tara’s book when I was recovering from cancer treatments. Its impact was huge. Teva Harrison, author of In-Between Days and a woman living with metastatic breast cancer. Her absolute determination to live life fully and with joy despite her health struggles makes my heart soar and takes my breath away. Mary Jane Copps, also known as the Phone Lady. Mary Jane is a friend and mentor. I absolutely love her capacity to develop community and to treat every person she meets with dignity and warmth. My mom taught me about having courage to give just about anything a try. When I was a kid she bought my siblings and I cross country skis and a book about how to ski. I still remember standing out in the cold while she read to us and told us how to do it. We had never seen anyone cross country ski before. My 90 year old neighbour Audrey who hand delivered invitations to her 90th birthday party. There were over 100 people at the party – at 90! I consider all of these women as part of my Wild Woman Sisterhood. On November 25 from 1 to 3 pm, as part of my Craft LAIR (Local Artist in Residence) at the Centre for Craft Nova Scotia I’m hosting a Wild Woman Circle. Please join me for an afternoon of all things fibre and becoming a wild woman. 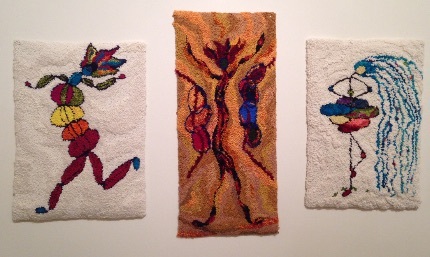 My Wild Woman mats will be on display and I have a few surprises planned. Feel free to bring a project or a piece of writing you are working on. Writers, fibre artists and all welcome. Who inspires you? Let me know in the comments below, or send me an email. I’m happy to connect with you.